In a free, public event, Jeffrey J. Selingo will deliver the 2016 John Jay Iselin Memorial Lecture. He is a best-selling author and award-winning columnist who helps parents and higher-education leaders imagine the college and university of the future and how to succeed in a fast-changing economy. 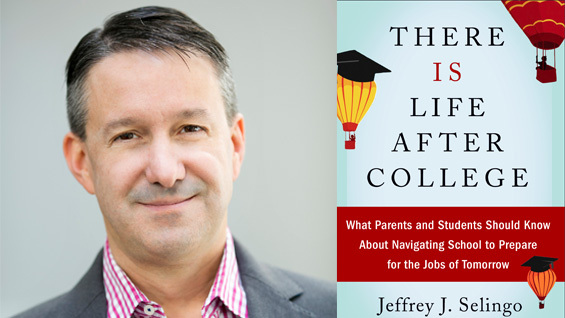 His newest book, There Is Life After College (HarperCollins, 2016), explores how today’s young adults need to navigate school for the job market of tomorrow. Jeff is also the author of College (Un)Bound: The Future of Higher Education and What It Means for Students, a New York Times best selling education book in 2013, and MOOC U: Who Is Getting the Most Out of Online Education and Why. A regular contributor to the Washington Post, Jeff is a special advisor and professor of practice at Arizona State University and a visiting scholar at Georgia Tech’s Center for 21st Century Universities. He is the former top editor of the Chronicle of Higher Education, where he worked for 16 years in a variety of reporting and editing roles. His writing has also appeared in the New York Times, the Wall Street Journal, and Slate, and he is a contributor to LinkedIn, where you can follow his blog posts on higher education. The John Jay Iselin Memorial Lecture honors the 10th President of The Cooper Union, Jay Iselin, who served from 1987 to 2000. Prior to coming to The Cooper Union, Jay Iselin served as General Manager and then President of Channel 13, and was largely responsible for making Public Television a vital force in broadcast journalism, originating such programs as Great Performances, Nature, Live for Lincoln Center and The MacNeil/Lehrer NewsHour.